Aren’t allowed to keep a pet in your dorm? Can’t handle the cost of dog food? Too busy to keep up with fish that seem to constantly die on you? Well, fear no more: there’s an alternative for you. Instead of adopting a pet, you can adopt a plant! College students are low on money and resources, but desperate for love—and they can now find a cure for their loneliness in becoming a plant mom. Growing plants is not only a cure for loneliness, but it’s also environmentally beneficial! There is a satisfaction in the knowledge that parenting your little plant is also saving the world. Plants can make a college student feel like they’re actually helping the environment at a stage of life in which they can’t have a garden or even recycle their own cereal boxes. Not only do plants help students feel like tree-huggers, but they are now also super trendy and make great accessories. 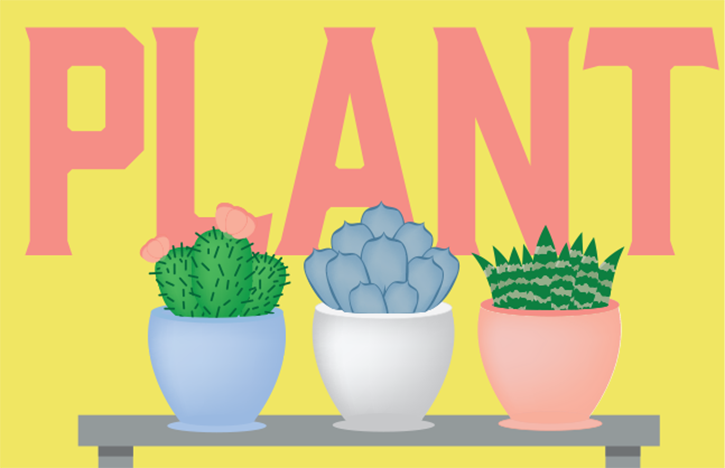 Plants have become so popular in recent years that they can be found on everything, from cups and bowls to room decor and fashion accessories. Junior Paige Lunde said, “I had never thought of buying a plant until I was at Walmart. They were really cute, so I decided I liked them and bought two!” Because plants are so inexpensive, their purchase does not take much consideration. Paige and her friends now own cups and bowls to go along with their plants. Miranda Coffee, mom of nine plants, said, “I have lots of plants! I started getting into them when my freshman-year roommate bought a few. After seeing them in our room, I fell in love. I keep them in mugs and little bowls mostly, but I have a few at home in fairy gardens. All I have to do to take care of them is spray a bit of water every so often, and keep them near sunlight to keep them happy.” Plants not only require little care, but they fill a room with life, and can be therapeutic and stress-relieving. It’s easy to see why people have fallen in love with these little companions. I, myself, am a plant owner. I have five plants, and I love taking care of them. It’s a tradition of sorts that when a friend or I brings home a plant, we help each other pick out its name. Sometimes we’ll even paint the name of the plant on its pot, bowl, or mug. The naming of these plants is generally the reason behind the term “plant mom.” No one likes to be alone, and I find it nice to look up at my window and see the little plants. Plants are affordable, a nice pop of color, and make the room a little calmer and trendier. The more plants the merrier, so find them for sale at a store near you. Become a plant mom today!